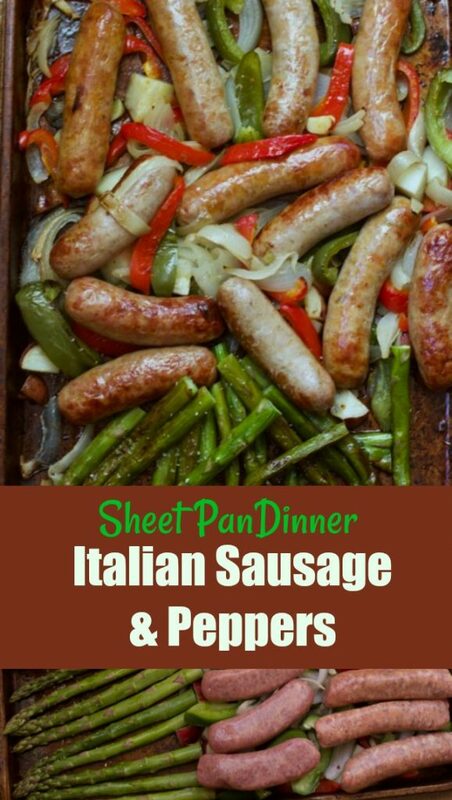 Sheet Pan Dinner can be prepped either earlier in the day or while the oven is preheating. You don’t have to worry about dirty pans and cleanup is a breeze. When it’s just the family, I just serve the sheet pan on the table, talk about no sweat dinners. 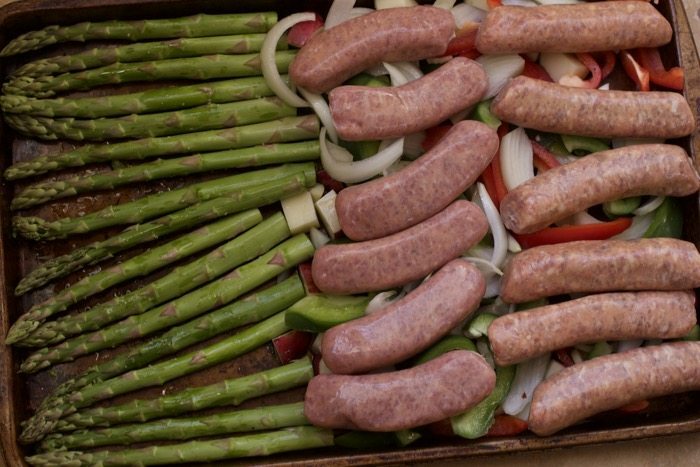 Our grocery store had thick asparagus so I was able to start them when I started my Italian sausage. If they are thin, I would advise adding them halfway during the baking process to avoid them burning. 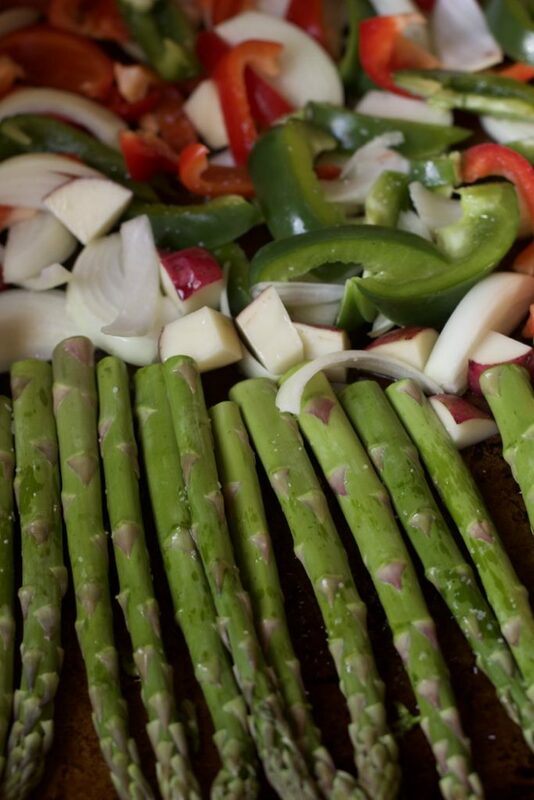 Simply dress the cut veggies with olive oil, kosher salt, black pepper and a little garlic salt. It could not be simpler than this. 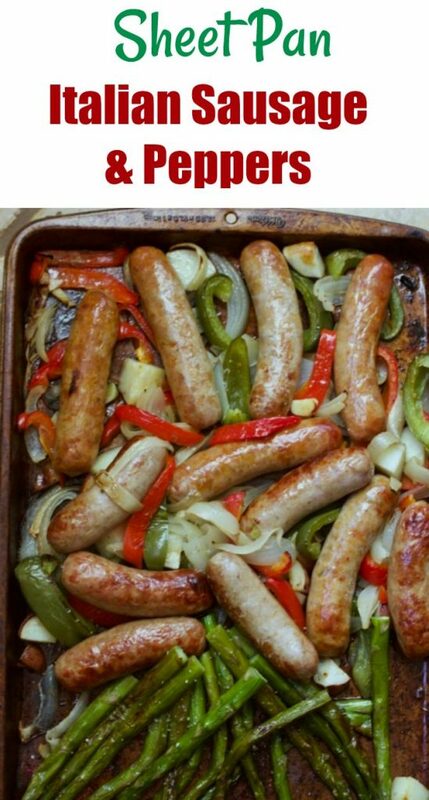 Top the peppers and onion mixture with the Italian sausage. I used a mix of turkey and pork and spicy and sweet. The choice is yours. Bake away. 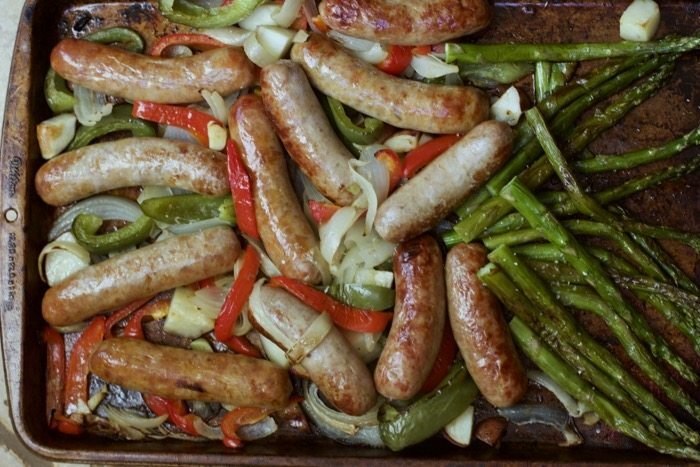 Set a timer for 20 minutes and turn over the sausages and mix up the veggies a little. This is the time to add the thinner asparagus. My family prefers crusty sausage, like they came off the grill, so after another 20 minutes of baking, I took off the asparagas, moved the sausage to the other half of the pan, and broiled the sausage for an additional 5-10 minutes. Just don’t leave the area while you do this. A simple one pan dinner, perfect for any busy weeknight dinner. 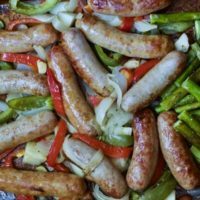 Italian sausage and peppers is a classic dinner, now made in one pan. Add peppers, garlic onions to a baking sheet. Add the olive oil, garlic salt, salt and pepper and toss. Put the sausages ontop of these vegetables. Add asparagus to other side and toss with olive oil and salt. 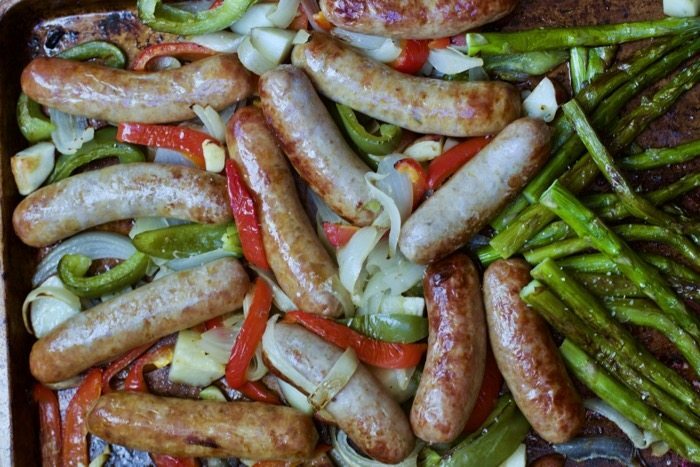 Bake until the sausages are cooked through and the vegetables are tender, 40 to 45 minutes. Turn over sausage and veggies half way thru. for a deeper color, broil sausage for 5-10 minutes watching carefully. Feel free to remove asparagus at this point. Feel free to half, or even double this recipe. Just use additional sheet pans to accommodate larger amounts. So I doubled all the spices and it was fantastic. I also added fresh onion and garlic. Sausage patty sandwiches my whole family loved. Will definitely make these again. THank you so much, it is so easy and great when you don’t want to grill..